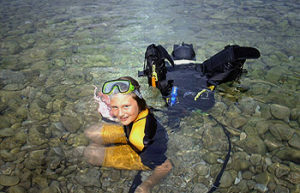 Underwater while scuba diving and respond even better and more quiet in emergency situations. 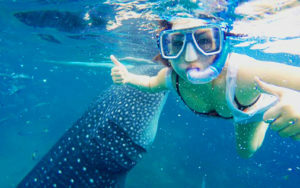 Therefore the initial learned Snorkeling training will be enhanced in terms of static diving and free diving for extended distance and depth. These courses may be restricted to 3 minutes static diving time and 60 meters distance as well as 25 maximum depth free diving. For further and continuing education, especially in the direction of athletic competition, we recommend an international apnea association. In this course, you will be methodically introduced to these dives. From the beginning with partially water filled overhead environment systems or in cave-like conditions. Here, the required use of materials is taught to you as well as the necessary safety precautions. For further and continuing education, especially in the direction of cave diving, we recommend an international diving association for cave diving. Diving with a rebreather makes it possible to dive almost silently under water. For your underwater photography this gives you the chance to get even closer to your subjects. There is an additional expenditure on technology necessary among other things. Different gas mixtures are used. Therefore, this course focuses on the increased risk of accidents caused by mixed gases as well as the correct handling of the rebreathers. Among other things, subject-specific teaching materials (company affiliation) are consulted for the training. For further training steps we recommend an international diving association for special Rebreather Diving. 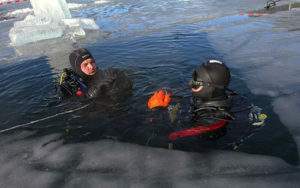 The exact planning as well as the creation of your ice diving entrance with all safety criteria is in the foreground of this training and will be conveyed to you in this course. You will be trained to perfect you buoyancy to protect underwater marine life and underwater photography equipment. Further, the handling of the photography equipment is taught. Here you will learn to understand the meaning as well as the sensitivity of underwater monuments. You will learn how to recognize underwater monuments and behave accordingly. Dear Parents, Scuba Kids Diving was created to enable your child to have an extended contact with the medium water. This course strarts with getting used to the environment water with first snorkeling skills. Further we choose a child-friendly diving equipment and environment to teach the children the proper handling of the equipment. Swimming skills and behavior as well as the safety on and in the water are strengthened.